Diquís spheres to be declared UNESCO World Heritage site — The Tico Times. For anyone who has visited Costa Rica’s Osa region (Southern Pacific) it is likely that they saw at least a couple of pre-Columbian spheres of Costa Rica. What is less known, is that these spheres are only originally found in the Osa region. If you see a Pre-Columbian spheres of Costa Rica outside of the Osa region, it is completely out of place and has obviously been moved. When these spheres were first discovered many were destroyed by those who found them as they were rumored to have gold in the center of them. There are fewer than twenty known spheres that have not been moved or disturbed from their original placement by some long gone indigenous group. 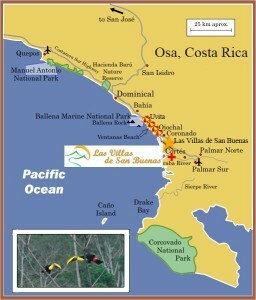 Finca 6 is only twenty minutes from Las Villas de San Buenas. We provide directions to our guests and clients. Contact us for more information.